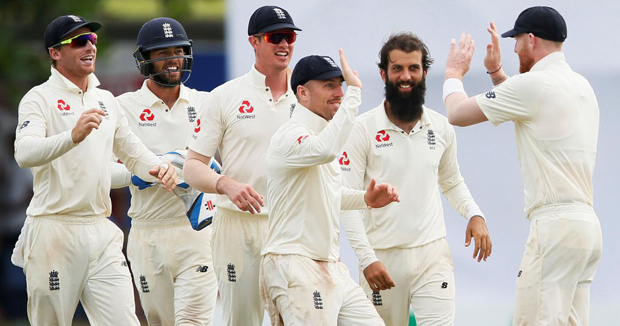 Galle, Nov 9: Spinners Moeen Ali and Jack Leach combined to destroy Sri Lanka and bowl England to a comprehensive 211-run victory inside four days in the first Test on Friday. With no realistic chance of winning after conceding a 139-run first innings lead to England, Sri Lanka tried in vain to force Rangana Herath's farewell Test into its final day. Yet while Angelo Mathews made his second fifty of the match and Kusal Mendis contributed 45, the rest of their batting order failed to offer substantial resistance as they collapsed for 250. Moeen claimed 4-71 as he and fellow spinners Jack Leach and Adil Rashid shared eight of the 10 Sri Lankan wickets. Playing his 93rd and last Test, Herath was the last man out, diving into his crease in a failed effort to avoid being run out. Beginning day four on 15-0, Sri Lanka needed a solid start to prolong their battle and overnight batsmen Dimuth Karunaratne and Kaushal Silva saw through the first hour without any damage as they put on 51 runs for the opening stand. Karunaratne enjoyed a slice of luck on 16 when he edged Moeen, but Stokes grassed an easy catch at slip. Stokes was later subjected to similar agony as he watched James Anderson drop Mathews off his bowling. Leach eventually made the breakthrough when Silva could not connect a sweep shot and was dismissed leg before wicket for 30. He was soon joined in the dressing room by Karunaratne (26), who charged down the pitch against Moeen and drove it straight back to the off-spinner, gifting him his 150th Test wicket. Kusal Mendis added 46 runs with Mathews for the fourth wicket, but he too could not convert a good start into a big innings and fell for 45. Leach bowled Dinesh Chandimal for one, the Sri Lanka captain struggling to move because of a hamstring injury, but Moeen struck the biggest blow when he dismissed Mathews for 53, effectively ending Sri Lankan resistance. The second match of the three-Test series is in Kandy, starting on Nov. 14, before the final contest in Colombo from Nov. 23.